I hadn't forgotten to get to this...just forgot where I put the photographs. 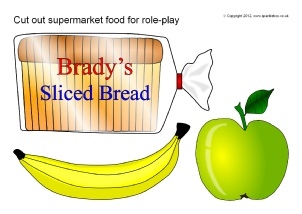 This is part 2 about using supermarket role plays in the classroom, preschool, kindy or (like me) at home. This post will look at other toys you can use and some basic display/storage ideas. In part 1 (CLICK HERE if you missed it) I showed different ways you can make fruit, vegetables and cans if you are crafty. But what about the rest of the people who don't have the skill or time? Plastic fruit and vegetables come and go from discount stores but usually you can pick up a bag with about 10 pieces for A$3. All you need do is buy a few sets and presto - you have the beginnings of a role play game. Of course, the other advantage to plastic fruit and vegetable is that it is easy to clean and disinfect as well. Tip: Always check out the pet department at the local discount shop - you can get some neat looking roast chickens and fish there! Usually in the dog section - but be warned - most will squeak when squeezed. Now, how do you actually set up a role play centre? This is going to depend on your budget and the amount of room you have available to use. This is the one my kids play with It was purchased on special for about A$70 a few years ago. It has a couple of shelves on the front and side (as well as the stand on the top). The door to the fridge opens but even my two can pull it off. The only downside is that the cash register doesn't actually do anything. At the moment the size is just right but by the time they are about 4 years old I would think they'll be too tall for it. So it probably is only an option for kindergartens or preschools. This is going to also depend on size but at least here are a few ideas. I bought these baskets first from Cheap as Chips for about A$5 each. They are great but too big for small children - if your students are about 7 years+ then they would work fine but anything younger then have a look at the blue and pink versions. These larger ones came in a few different colours: pink, blue, and green. These are much smaller than the one above and perfect for younger children. The little hand you see is actually my daughter who is nearly 18 months and loves playing supermarket with her brother. As you can see they are a perfect size and hold quite a bit. I would recommend these smaller ones up to about Reception/grade 1. They came in both blue and pink but no neutral colour, such as green. These ones are a little easier to clean than the larger one shown above as they have smaller holes on the side and a much smoother finish. 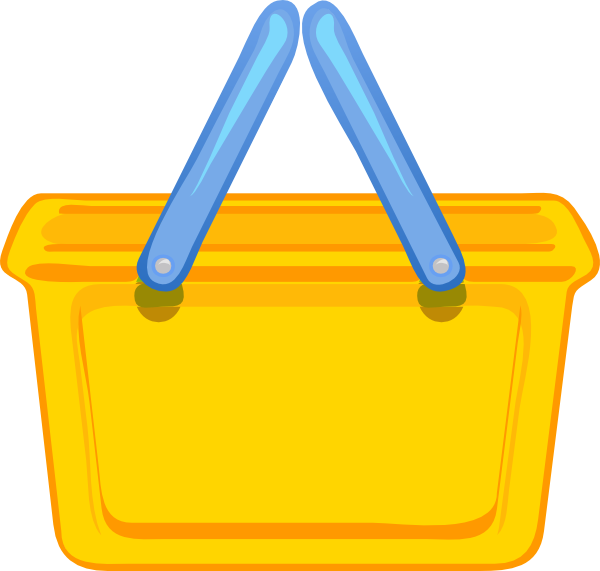 Both types of baskets though have movable hands which makes them quick and easy to store. The trolley is great - my two constantly go and pick out their food and then run around the house "delivering" the items and then pack them up and again and start all over again. These trolleys (sorry, can't remember where these were bought from) also have handles that can be released into a downward position for storage. My advice is only go for these though if you have plenty of room! and only once you've given clear instructions on picking up the food afterwards! I recommend buying shelves like shown. All these were purchased for less than A$8 each and all can be taken apart and stored in a cupboard when not in use. This pink stand has shallow baskets and is great for a fruit and vegetable display. I prefer the black shelves though for putting the cans of food and basket on when not in use but as you can see sometimes my kids have different ideas about where to put them! What a great idea! I teach grade three, and my students still LOVE to play store. I always make them cardstock credit cards as well as cheques and cash. I'll have to add in some of these ideas this year! I didn't think to show the cheques (probably as my two would rip them into pieces at their age!) but they do help to make it "real". I love the idea of credit cards, too!